This sounds like it's going to be so much fun. The first photo from the new Michel Gondry film has hit the web. Gondry moves quickly and quietly when working in France, we didn't even know this was shot yet. Microbe et Gasoil, as it's titled (or Microbe and Gasoil), is already filmed and stars Ange Dargent and Théophile Baquet as the two boys, along with Audrey Tautou. This first photo won't make sense until you hear the plot, then you'll have a big smile on your face when you realize. 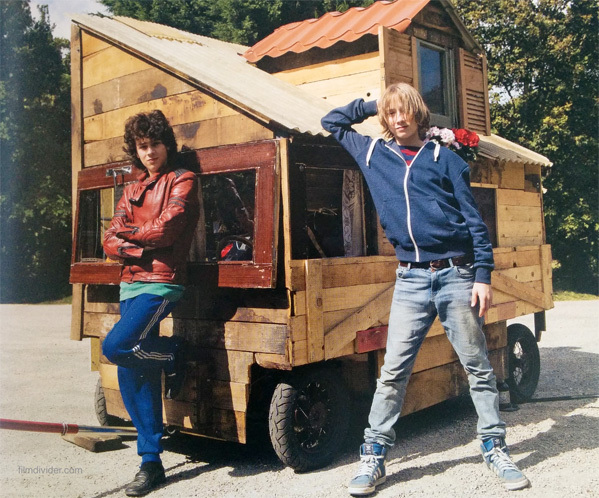 "As the summer holidays approach, the two friends don't want to spend two months in the company of their families, so they build their own 'car' out of a motor mower and some planks of wood, and set off on an adventure on the roads of France." This photo comes from promo material at Cannes, along with plenty of other first look reveals. But there's just something particularly amusing about this shot - especially knowing it's another brilliant Michel Gondry creation. Two kids taking a riding-mower-turned-car around France? Look at that thing! This is going to be awesome. The two lead characters are: "Microbe is a child in the margins, often immersed in his drawings; Diesel is an inventive and cheeky boy, was parachuted into school in the middle of the year. They immediately develop a deep friendship." I'm looking forward to this already. No word yet on any US release info, but we're hoping this shows up at a festival soon and hits theaters not long after. Stay tuned for more. Dude's name is "Microbe"? I am in.